Canada was represented by 720 athletes competing in all 36 sports, the most athletes to represent Canada at any multi-sport event. Two Gold Medals for Andre De Grasse in the 100m and 200m events. Two Silver Medals for Dominique Bouchard in 200m backstroke and 4x100m medley, to go along with a Gold Medal in 4×100 Freestyle. Four Gold Medals in Gymnastics for Ellie Black. Freestyle swimmer Emily Overholt won Gold, Silver, and Bronze Medal. Hugo Barrette won Two Gold Medals and One Bronze medal in Cycling. Jaret Llewellyn won two Silver Medals in Water Skiing. Jasmin Glaesser won a Gold Medal, and two Silver Medals in Cycling. Kate O’Brien won a Gold and Silver Medal in Cycling. Lynda Kiejko won two Gold Medals in Shooting. Mark de Jonge won a Gold Medal and a Bronze Medal in Canoeing. Meaghan Benfeito won a Gold and Bronze Medal in Diving. Michelle Li won a Gold Medal and a Bronze Medal in Badminton. Michelle Russell won two Silver Medals in Canoeing. Monique Sullivan won two Gold Medals in Cycling. Patricia Bezzoubenko a Silver Medal and Bronze Medals in Gymnastics. Philippe Gagné two Silvers and a Bronze in Diving. Richard Funk won a Silver and two Bronze medals in Swimming. Ryan Cochrane won two Golds in Swimming. Santo Condorelli two Silver Medals and a Bronze Medal in Swimming. Shawn Delierre a Gold and Silver Medal in Sqaush. Sydney Pickrem a Silver Medal in Swimming. Tiffany Foster, Eric Lamaze, Ian Millar, Yann Candele, and Elizabeth Gingras won the Gold Medal in the Team show jumping event. Whitney McClintock won two Gold Medals and two Silver Medals in Water Skiing. 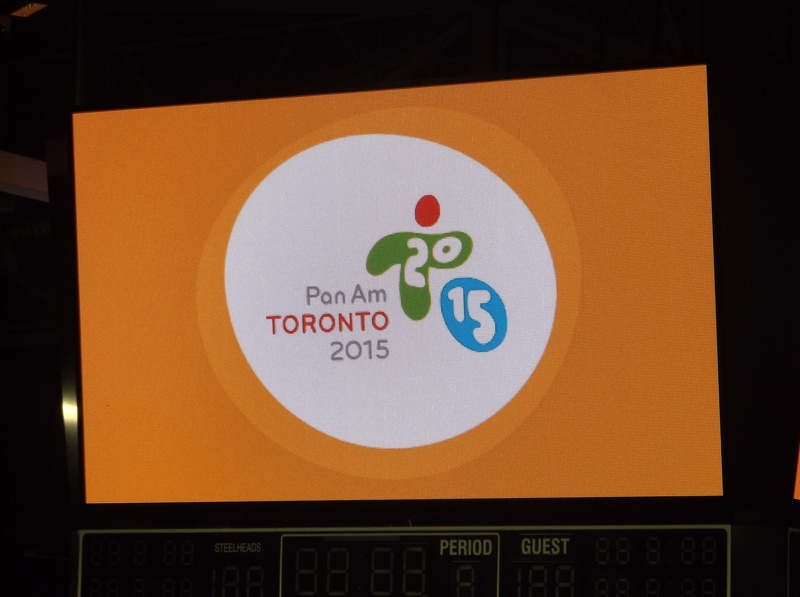 We should thank all our athletes for all the hard work they put representing our country at the Pan Am Games. We are proud of you all! This entry was posted in Sports and tagged 2015 Pan Am Games, 2015 Pan American Games, Andre De Grasse, Bronze medal, Dominique Bouchard, Ellie Black, Eric Lamaze, Gold medal, Hugo Barrette, Jaret Llewellyn, Jasmin Glaesser, Kate O'Brien, Lynda Kiejko, Mark de Jonge, Meaghan Benfeito, Michelle Li, Michelle Russell, Monique Sullivan, Pan Am Emblem, Pan Am Games, Pan American Games, Patricia Bezzoubenko, Philippe Gagné, Richard Funk, Ryan Cochrane, Santo Condorelli, Shawn Delierre, Silver medal, Sydney Pickrem, Synchronized swimming, Tiffany Foster, Toronto Ontario, Whitney McClintock, Women's 10 metre air pistol, Women's 10m Synchro Platform, Women's 3m Springboard, women's cross-country, Women's K-4 500m, Women's trap. Bookmark the permalink.